opposite the greek island SAMOS. 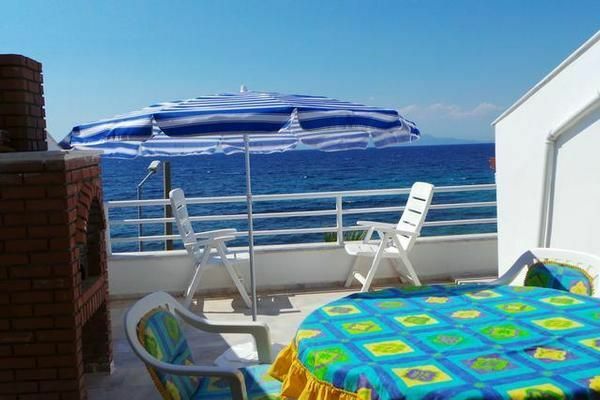 The apartment SEA VIEW is located in a fantastic location right on the beach with beautiful nature and sea views. Especially beautiful from the large terrace every evening fascinating sunsets experience. The apartment has a living area of 70 m² and a large terrace. and enjoy the mountains of the NATURE RESERVE PARK in GÜZELCAMLI. to give you a wonderful and relaxing holiday. The living-dining area offers enough space for 5 people. It has two bedrooms, a bathroom and a small kitchen. A leisure paradise with a clear blue sky and crystal clear water. If you are looking for peace and quiet, this is the place for you. The top floor apartment is nicely furnished and air conditioned. All furniture, dishes etc. are brand new. Radio and Satellite TV available. In this apartment you will feel good all around. • The well-equipped small fitted kitchen lacks nothing to supply itself. • One single bed in the living room. • The minimum stay is one week. • The Fe / Wo may only be occupied by the persons listed in the travel registration. • At the conclusion of the contract € 150, - per week, the balance in Turkey due upon delivery of the keys. • A security deposit of € 250 is required upon arrival. • After booking, confirmation and invoice will be sent to the e-mail address provided. Wi-Fi is possible in every restaurant or cafe. There are no problems. • Bed linen is provided. • Hand and bath towels are available. • Please bring beach towels with you. Please bring your hand and bath towels with you. • The surrounding area offers many opportunities for hiking. - Final cleaning: to be performed by the tenant per object per day (obligatory).